NEW figures of passenger complaints from the Office of Rail and Road show that two open access operators, Grand Central and Hull Trains, were the second and third worst in the rankings. However, the ORR added that it was discussing data quality with Hull Trains, and that its figure should be ‘treated with caution’. Most complaints sent to operators were about performance. There were more complaints for each 100,000 journeys about Caledonian Sleeper than any other operator. CS received 270 complaints in the three months to December, an increase of 120 per cent on the same quarter a year earlier. Grand Central was sent 239, which was virtually the same as the equivalent quarter in 2017-18, while Hull Trains had 153. This, assuming that this total is correct, was an improvement of 41 per cent on the same three months in 2017-18. Transpennine Express saw a rise in complaints of 79 per cent, with 76 for each 100,000 journeys, but many operators had fewer complaints. These included London Overground, which was down 70 per cent and at the last place in the list with just one complaint for each 100,000 journeys. West Midlands Trains improved by 50 per cent, to 19 complaints, and Heathrow Express by 27 per cent, with 21 complaints. The greatest increase in complaints was reported by Northern, whose total of 52 complaints for each 100,000 journeys was up by 290 per cent compared with the same quarter in 2017-18. Other operators recording fewer complaints included LNER, CrossCountry, Southeastern, Govia Thameslink Railway, TfL Rail and Merseyrail. The amount of time taken to deal with complaints also varied widely. Nationally, 94.8 per cent of complaints were ‘closed’ within 20 working days in the third quarter of 2018-19. This was one percentage point higher than the same quarter last year, while 17 out of 23 train operators met the industry requirement to close 95 per cent or more of their complaints within 20 working days. Hull Trains and Northern saw the largest deterioration in their rates of response to complaining passengers. If the figures from Hull Trains are correct, the company answered just 5 per cent of complaints within 20 days, while Northern reported 73 per cent, which was the next worst. Those achieving 100 per cent were CrossCountry, Southeastern, Heathrow Express, Govia Thameslink Railway, Chiltern Railways, Merseyrail and Grand Central. 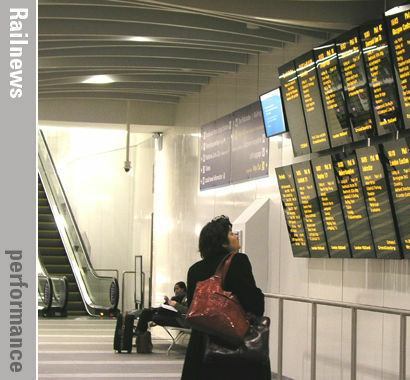 Rail Delivery Group regional director Robert Nisbet said: ‘We know that services on some routes weren’t good enough last year.’ The figures were published just after GWR and Greater Anglia had become the latest operators to offer Delay Repay 15, which is the Department for Transport ’s ambition for more franchises over time.